Spending Valentine's Day in Prague is about as romantic as it gets. The city boasts wonderful sights and first-class restaurants to impress your loved one with. And February is low season at hotels, so enjoy the best of romance at the best prices! How will you impress your Valentine in 2020? * A romantic meal by the river? Dinner at a hillside restaurant overlooking Prague? Should it be historic or a modern restaurant? : romantic restaurants. * And how will you start the night off? Cocktails with a view sounds impressive! : bars with city views. * For a little more extravagance and a first-class experience, try the: Opera & Dinner Package. * Or search through a whole range of entertainment options: Prague entertainment. * The river runs through the heart of the city, so taking a river cruise allows you to dine and take in the sights at the same time. For a romantic experience, there are two truly special cruises to choose from: the A La Carte Cruise and the Panoramic Cruise. But there are also several other cruises from lunch to afternoon to evening dinner cruises to consider: Prague river cruises. 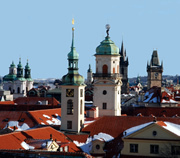 * Prague Experience offers a wide range of city tours. Explore the awe-inspiring sights with a local guide, who will bring the city to life for you: sightseeing trips. * And what sums up the mood of Prague better than a classical concert in one of the quaint old churches or 'dinner & jazz' at Café Mozart: classical & jazz concerts. 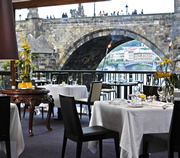 * Prague Experience has special offers on various city centre hotels over the Valentine's Day weekend: Prague hotels. * Or, for an easy, great value way to organise your Prague trip, consider the Prague Package. It includes a choice of city centre hotels, Prague airport transfers, a city tour and entertainment. Let Prague Experience do the hard work. We'll ensure things run smoothly, while you get all the credit! For an introduction to Prague: Prague tourism information.